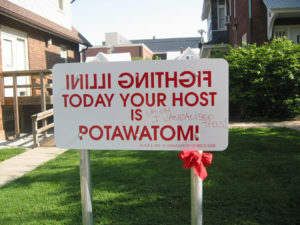 The signs in Edgar Heap of Birds’ installation were vandalized for a fourth time on May 10, 2009. Someone wrote on one sign and two other signs were bent further. [T]he dilemma of the emperor’s new clothes, we might call it—is a tension faced by any society driven by bitter histories of imposed hierarchy. Creating community, in other words, involves this most difficult work of negotiating real divisions, of considering boundaries before we go crashing through, and of pondering our differences before we can ever agree on the terms of our sameness. Perhaps one reason that conversations about race are so often doomed to frustration is that the notion of whiteness as “race” is almost never implicated. One of the more difficult legacies of slavery and of colonialism is the degree to which racism’s tenacious hold is manifested not merely in the divided demographics of neighborhood or education or class but also in the process of what media expert John Fiske called the “exnomination” of whiteness as racial identity. Whiteness is unnamed, suppressed, beyond the realm of race. …[T]he majoritarian privilege of never noticing themselves was the beginning of an imbalance from which so much, so much else flowed. …[T]he creation of a sense of community is a lifelong negotiation of endless subtlety. …[T]hose marked as Having Race are ground down by the pendular stresses of having to explain what it feels like to be You—why are you black, why are you black, why are you black, over and over again; or alternatively, placed in a kind of conversational quarantine of muteness in which any mention of racial circumstance reduces all sides to tears, fears, fisticuffs, and other paroxysms of unseemly anguish. …I believe that racism’s hardy persistence and immense adaptability are sustained by a habit of human imagination, deflective rhetoric, and hidden license.